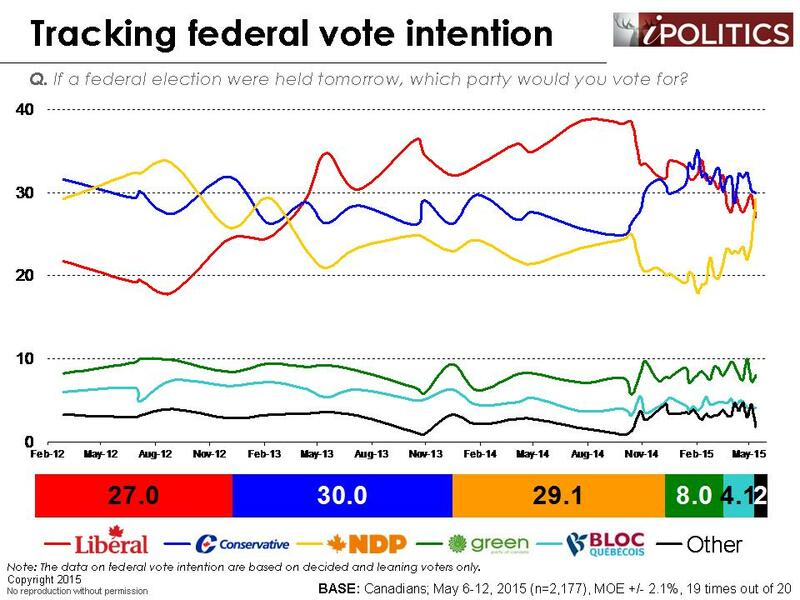 The NDP has jumped five percentage points over the last week and the story here appears to be one of NDP success, rather than a decline in Conservative or Liberal fortunes (who are both just slightly down from their rolling average over the past few weeks). There are clear echoes of the shocking Alberta result, but it would be a mistake to see the NDP ascension as merely a bounce from Alberta. Indeed, there has been a clear pattern of an NDP rise over the last four months (from 18 points in early February to 29 points today). There are some important sources of this rise. There are two prevailing trends that are driving NDP fortunes. The first is a dramatic capture of the university-educated vote, which was critical to the Alberta NDP’s historic victory last week. Whether this is a ‘strategic’ response of the promiscuous progressive segment of the electorate (who are more focused on how best to depose Stephen Harper than any particular party choice) or just rising antipathy to the perceived anti-intellectualism of the current government is unclear. The second factor is a decisive lead in what was a log-jammed Quebec race. The NDP is also newly competitive in Ontario which is now a three-way race. 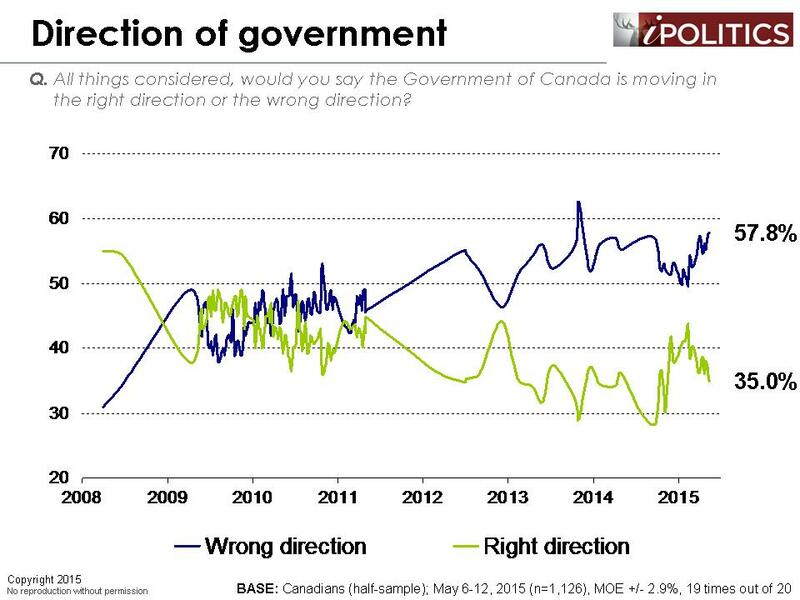 Stephen Harper’s already last-place approval rating is down sharply, as is the directional approval of the federal government, which has reached a new low for this year. 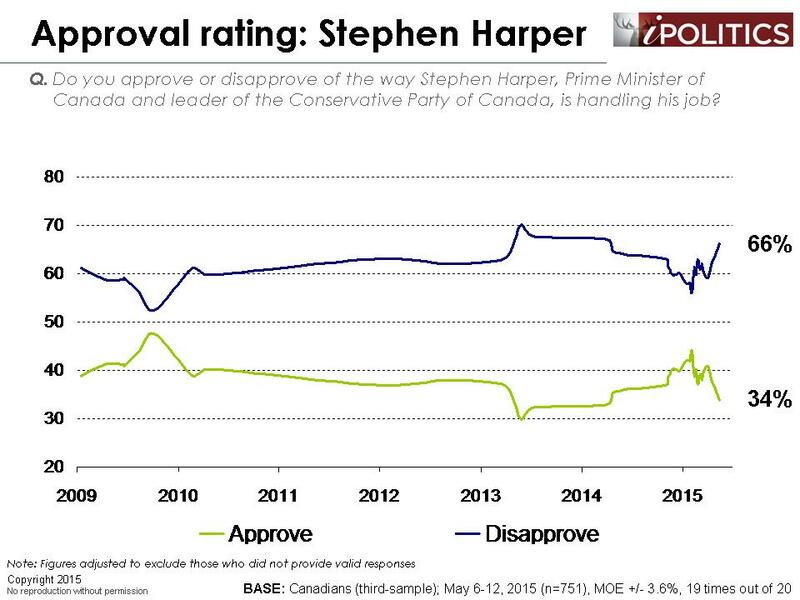 Given these two findings, one could argue that Mr. Harper may be poised for decline. Mr. Harper now finds himself in a cluttered three-way tie, stuck ten points below his majority achievement in 2011. Moreover, this challenging position exists in spite of the fact that Mr. Harper and the Conservatives have clearly owned the airwaves and the podium. Whatever problems the Liberals are having, they do not appear to emanate from voter response to their leader. 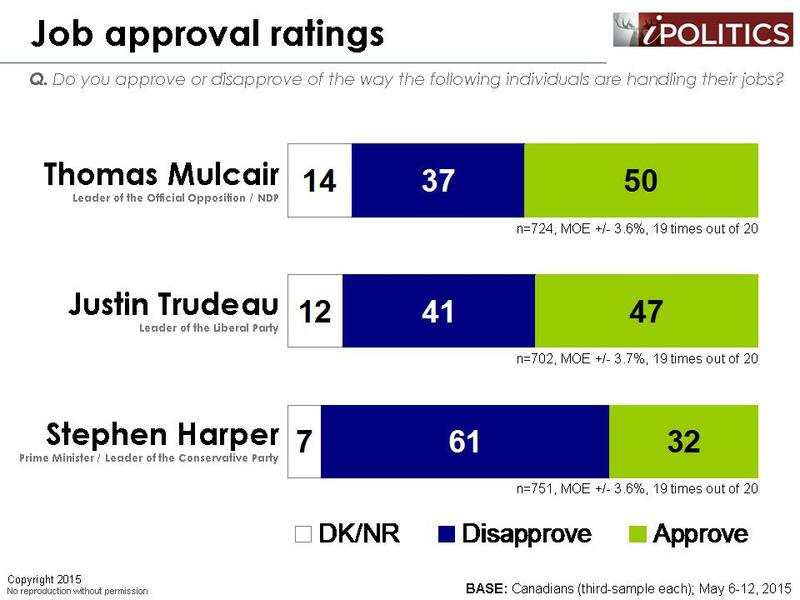 Justin Trudeau’s approval numbers remain high and are comparable to those of Mulcair, suggesting that the Liberal Party’s stagnation is also due to other factors. 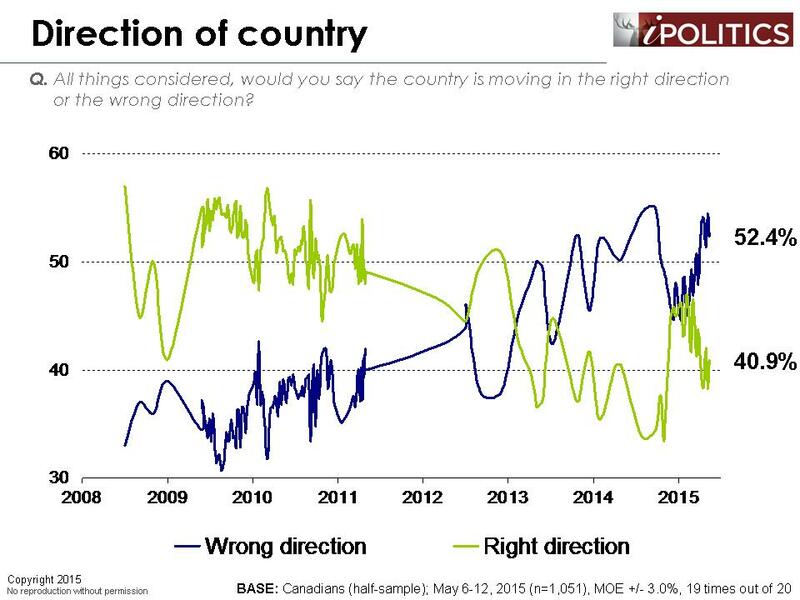 In fact, Mr. Trudeau has seen a modest rise in his approval rating over the past few polls. 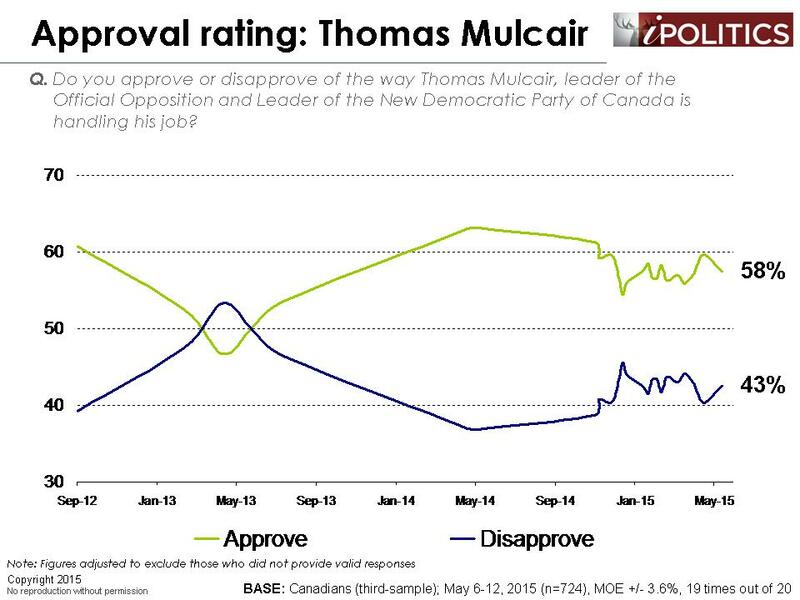 Finally, we see that Thomas Mulcair’s approval is actually down from last month (albeit insignificantly). 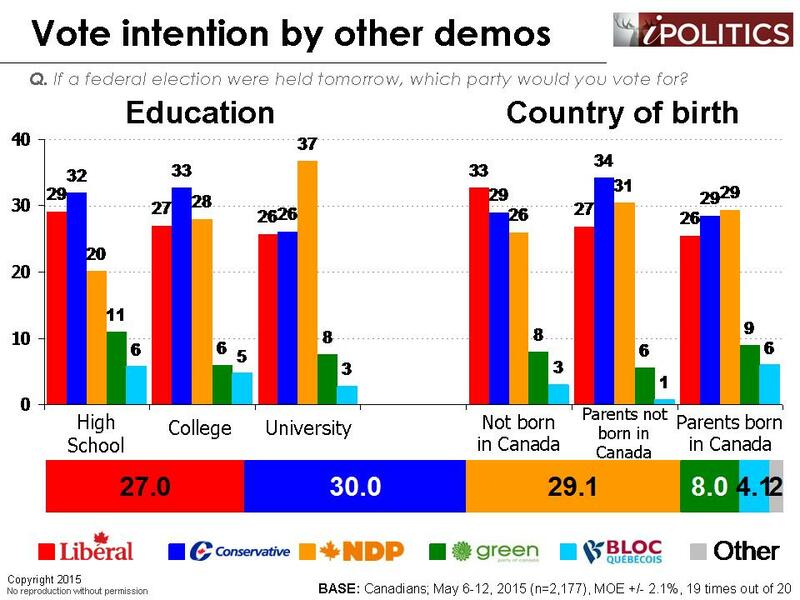 This suggests the NDP rise is linked to factors beyond the luster of the party’s leader. 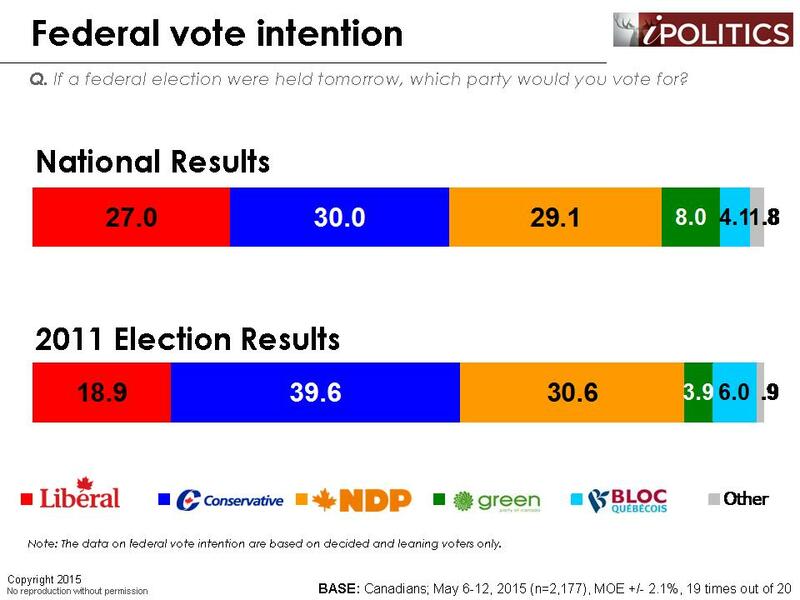 It may be interesting whether Mr. Mulcair receives more critical scrutiny now that he is part of this new three-way tie. 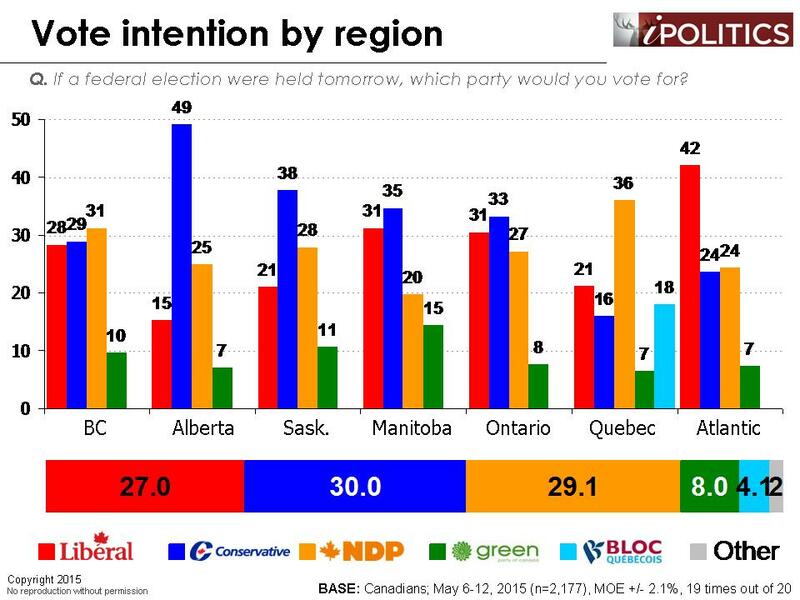 The critical question now is whether these shifts represent a new normal or whether they are an ephemeral bounce produced by the Alberta election. We believe that the public are indeed becoming engaged and that they are now in motion. Any forecast of where things are going at this stage would be foolish conjecture. Race on! The field dates for this survey are May 6-12, 2015. 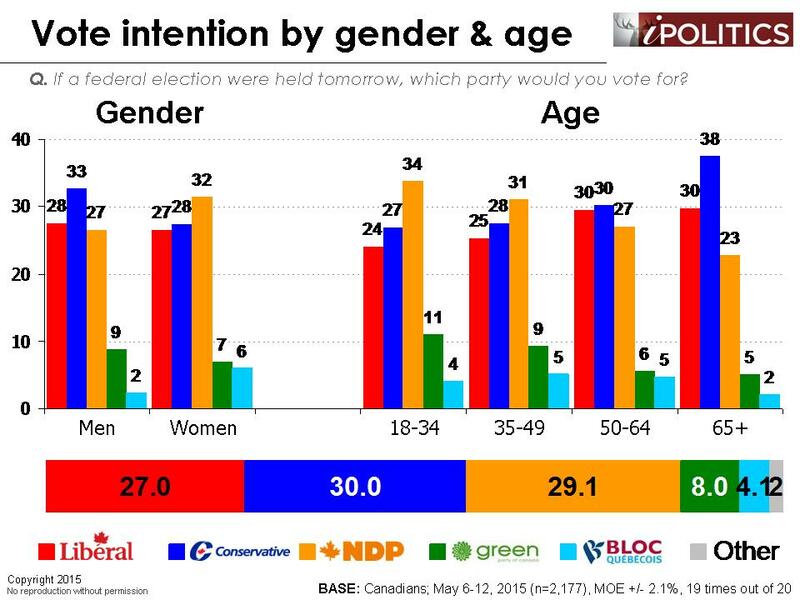 In total, a random sample of 2,177 Canadian adults aged 18 and over responded to the survey. The margin of error associated with the total sample is +/-2.1 percentage points, 19 times out of 20. Very interesting findings that I hope are a result of the people of Canada starting to realize that the government has not been transparent or honest and does not have a humane approach to public policy. At the same time, it is becoming clear that the NDP has an experienced, solid leader, with a humanistic vision of society. Hopefully, it also means that there is increasing concern for the environment. This is a good clear site; I have not seen a better. I wish you would pay more attention to the Green Party led by Elizabeth May. That party, it seems to me has the best policies overall and Ms May is a knowledgeable and eloquent speaker. Thank you! I agree totally. When you look at the websites of the partys, the only one that gives a clear and concise plan as to what they would do if in power is the Green Party. The others give all kinds of promises and generalizations, but there is no detail in their “promises”! The conservatives are exhibiting more and more that they are destroying democracy in Canada and are proving to be not the economic saviours they maintain they are. It’s time for a change in Ottawa. Where’s the seat count in all this garbage…last time I looked the CPC had a majority of the seats…and that’s what matters…4 more years of solid infrastructure investment, lower taxes and fair wages for public servants that are IN LINE with the rest of the international economy. The current denizen of 24 Sussex Dr. is a less than average politician whose shortcomings have finally surfaced in a pathetic, petulant, puerile manner. When I watch Harper, I always get the impression of an actor desperately attempting to master a theatrical role. And failing on a grand scale. HARPER IS THE ANTITHESIS OF A DEMOCRAT! Obliteration of the Conservative Party of Canada in 2015 is Canada’s only option. Good site. Clear. Concise. Well laid out. With obsession with things money, accounting and corporations, the conservatives have shown very clearly that they don`t believe in democracy, government by the people for the people. Its time for them to go. HARPER, that dictator and bully, has shown that he loves one thing war and fear in order to rule and stay in power – his pathetic and brutal demands aren’t transparent – Bill C51 is proof of his tyranny, fear and nonsense – Canadian values as i know them are NOT Harper’s values – get rid of him and his lackeys who haven’t the courage to stand up for the greatness that this country was before Harper – Harper and his Harpies have to go – get rid of that cancer before it’s too late and we slide into fear mongering tactics. With all things consider and looking closely at bill C-51 is more about controlling people in Canada than it is about keeping the country safe from outside influences aka ISIS. It does not stop sites and other avenues of information that is shared on the internet. Such as blocking sites or emails from servers that provide the propaganda that is harmful. It targets legal protesters with in the country that has nothing to do with ISIS or the threat from them and more so to control environmental choices and information so that sound information can be achieved and facts be known. No one should have to give up the rights to have freedom secured when it is the freedom that keeps people security within the country itself. Next is the notion that you tax then give back only because one can as the wealth is so high it really is tax rebate. However there is nothing in the budget to pay for the F-35 fighters that we need or some other new plane to do the service that Canada needs. Never mind the ships that need to be built are also not in the budget.. Along with extra security personnel need to move on Bill C-51 etc. Unless we strip from another service which is the child protection and the MMIW or for that matter the MMW that have not been solved as the numbers keep rising. No matter how we look at it and while selling off control and interest in vital services like the wheat board which buys from farmers or farmer more so sell to the wheat board which is now in the full control of the USA and Saudi Arabia hands. Guess who benefits from that aspect as I can assure you it is not the farmers by any means nor the flour mills in Ontario who get their supply of wheat from now outside foreign owners. So with that what other trade deals do we have where Canadian interest are sold off to outside foreign owners even if it is on Canadian soil. Harper is the best PM this country has seen. Unbelievable that people can not see what is directly in front of there eyes. Be careful what you wish for. Look at what the NDP did to Ontario and watch what it is going to do to BC. The Green Party has all the unrealistic solutions. Re the pipelines….the oil is going out by train…..which one do you think might be safer, the train or a well managed pipeline? By the way, I wonder how all the protesters get around to disrupt the G8, etc. Do they walk or take planes and cars? Where does all the fuel come from? Climate change…Canada accounts for less than 2%. Talking about control….the farmers think it is great that the Wheat Board is gone! We live in the best country in the world? Try living somewhere else, like I have, and you will realize how lucky we are. It also might be an idea to run for office so you can change all the things you don’t like.